The word Cadenza stands for a virtuoso piece of solo art. This is what you will be creating from the driver’s seat of the Kia Cadenza every time you set the engine into motion. You are conducting a concert the likes of which you have never seen or felt before. This is music in motion. With nearly 300 horsepower waiting to be unleashed under the hood, your concert will be felt by all who are there to observe. The Kia Cadenza was designed to move you, to move your family, and to move and inspire the hearts of all that it touches. 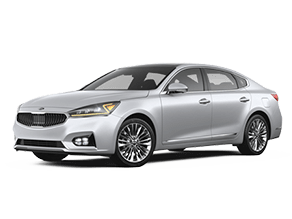 The Kia Cadenza comes equipped with a full surround system, and this is not just any surround system, this is an Infinity®2 Discrete Logic7® Surround Sound System. That means you get 12 speakers to surround you in your music, your news, your podcasts, or whatever else you care to listen to. Jam to the right tunes and you will feel like you have front row tickets to a live concert. A car should be designed for comfort, and Kia knows what they are doing in that regard. They have expertly crafted an elegant interior that includes dual-zone climate controls along with many other amenities. This ensures that everyone can ride in absolute comfort and at the ideal temperature. Kia is always trying to make everyone happy, and the Kia Cadenza with its dual-zone climate controls is just another example of that. Hill Start Assist Control or HAC comes standard on the Kia Cadenza. This handy feature ensures that you will not lose a second of control even when you are moving uphill from a dead stop. On a steep incline, the car lets you safely transition your foot from the brake to the gas without rolling backwards. This is achieved by briefly engaging the brakes while still allowing you to accelerate once your foot is on the gas pedal.